Cooking the chicken in this manner will result in a wonderfully moist and flavoursome meat. Place the butter, 1 sprig of thyme and chopped garlic into a small mixing bowl and mix well until combined. Use your hand to loosen the skin under the chicken. Slide the garlic & thyme butter under the skin and gently massage into the breasts. 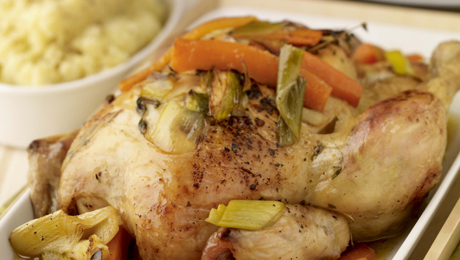 Put the chicken into a roasting dish and place in the pre-heated oven for 30 minutes. Add 1/2 tbs olive oil to a medium sized pan, add the leeks, carrot and celery and cook for 4-5 minutes until the vegetables have softened but not coloured. Add in the chicken stock and the other sprig of thyme and allow the mixture to come to the boil. Remove the chicken from the oven, pour the thyme and vegetable broth on top and cover with tin foil. Return the dish to the oven and continue to cook for another hour. Allow the chicken to rest for up to 20 minutes, then slice and serve with the mustard mash and some of the fragrant thyme and vegetable broth. Place the potatoes into a medium sized pot of cold water and bring to the boil. Reduce the heat and simmer until tender. Strain, return the potatoes to the saucepan, add the butter and wholegrain mustard and allow to continue steaming for 5 minutes to further soften the potatoes. Season with a little salt and pepper, mash and serve.